The Park Plaza Castle is an exhibit hall located at Columbus Avenue and Arlington Street. The building was originally an armory for the First Corps of Cadets, a Massachusetts military organization established in 1741. The former armory has three floors of function space, with a large exhibit hall on the main floor. The Castle is a unique venue for trade shows or business meetings. The main hall is comprised of 14,520 square feet of exhibition space that can furnish 84 8x8 booths or be configured differently. 1,500 people can be seated in a theater layout, or 1,800 people accommodated if used as a reception hall. The mezzanine contains many meeting rooms, and a grand Imperial Ballroom, with splendid features such as a proscenium-arch stage, crystal chandeliers, gilded balconies, and floor-to-ceiling windows. The Imperial Ballroom can entertain up to 2,000 guests for a reception, or 1,130 guests with banquet seating. There is also another level with numerous conference and meeting rooms. The armory is very historic, and is designated as a National Historic Landmark. 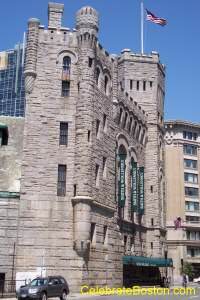 The building was completed in 1897, and is the last example of a Victorian armory in the city. The architect was William Gibbons Preston. The structure is built of masonry granite and steel, with its most notable feature being a six-story hexagonal tower that faces Park Square. The Castle has many beautiful architectural details: On Columbus Avenue, there are vertical towers and turrets, with a flat two-bay central section. On the uppermost story of the head house and tower, there are corbels surrounded by crenels (notches or openings) in the roofline. There is a winged dragon carved into the main tower, with other practical features too numerous to describe in this article. The First Corps of Cadets financed the construction of the armory in 1891. They were established in 1741, and were originally bodyguards for the Royal Governors of Massachusetts. In 1775, they became the Boston Independent Company, and were commanded by John Hancock and Henry Jackson. They participated in the Battle of West Point, and in the Siege of Yorktown. In the Civil War, they performed guard work at Fort Warren at George’s Island, where Confederate Prisoners were held throughout the war. During World War I, they served bravely in France at Chateau Thierry, St. Michel, and Verdun. In World War II they were one of the first National Guard units to be called up, and in 1962 they were re-designated as the First Battalion, 220th Massachusetts Infantry. The Castle is located near many attractions including the Public Garden with its summer Swan Boats, Cheers Beacon Hill, Hatch Shell, Boston Common, Newbury Street shopping area, Copley Place, Boston Public Library, Trinity Church and many other historic sites and attractions.